Boo! friends and family with one of our fun Halloween cards! 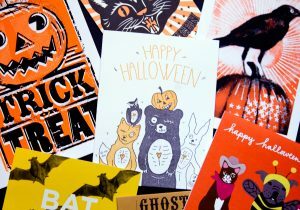 Send a card saying “hello”, spreading the spirit, or invite people over for a fun Halloween get together. Boo-ing is a fun way to connect friends and start a new tradition. You can even encourage your recipients to spread the spooky spirit by encouraging them to send a certain number of their own Boos. There is no wrong way to Boo someone! Most Boos encourage passing on the spirit to 2-5 others within one day of receiving your Boo. Booing is a great way to build community in your neighborhood, at work, and with loved ones across the country. Halloween is a wonderful time to bring people together, share in fun traditions, and celebrate each other, so be sure to display your Boos to ward off the spirit though, and be sure you don’t get Booed more than once in an office or neighborhood, spread the love! Begin putting together a list of the names and addresses of people to whom you want send holiday cards. This way, you won’t forget someone, or need to track down addresses last minute. Creating separate lists for family, friends, coworkers, and customers is an easy way to start getting organized early. With Sent Well, you can send different cards to different groups of people! Want a company or group specific design? No problem! We can work with you to put your logos on cards, include business cards, and personalize your cards to your liking with our talented group of designers and card writers. Let us help you spread the holiday cheer your way this year, and cross something off your already growing list of to-dos. October is National Pitbull Awareness Month! Pitbulls are the most misunderstood and therefore most abused dog in the nation. We at Sent-Wellknow pitbulls are great pals, and are one of the smartest, easily trained dogs out there. 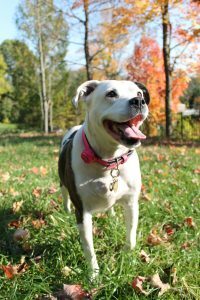 Darla, my own girl is a pitbull – she loves people, dogs, cats, basically anyone she meets – and she has an incredibly loving personality. Do you or someone you love have a “luv-a-bull” pitbull? Send a hello, and encourage others to adopt a furry friend this month! All cards with a dog on them are 20% off this month, proceeds will go to Mac’s Mission Organization! For more information about Mac’s Mission: www.iampitbullstrong.com.